Volcanic forces created inspiring islands in the middle of the Atlantic and designed magnificent landscapes. 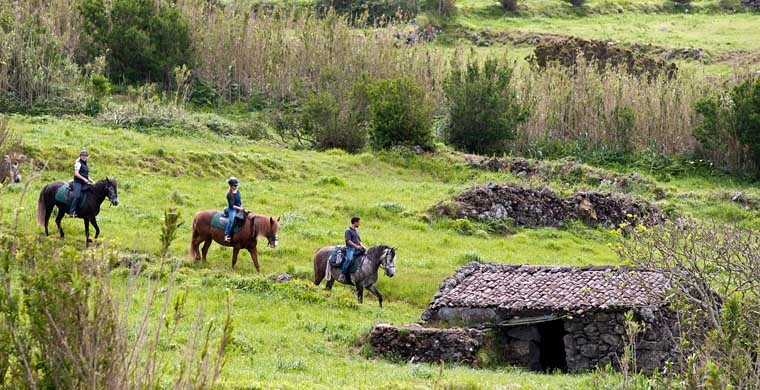 The unique nature of the Azores enchants the visitor - especially when traveling on horseback. 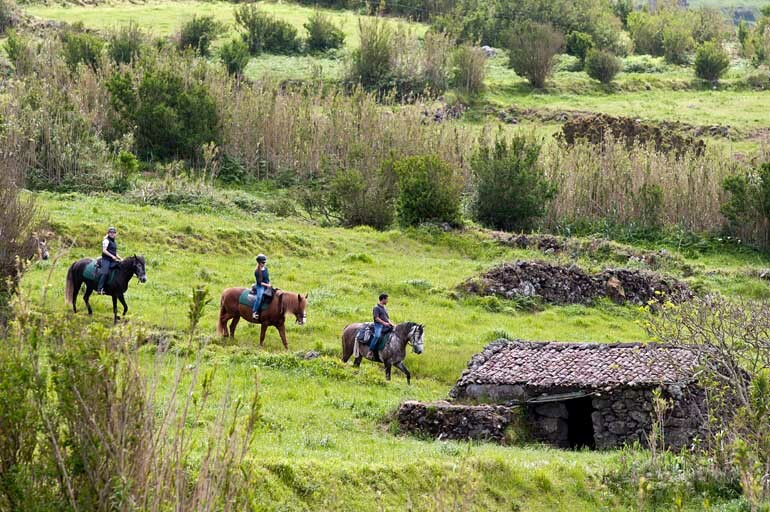 By riding through this marvellous landscape, you discover the hospitality and the relaxed style of life of the locals. Riding between hydrangea hedges, or through bizarre volcanic landscapes. Discover dreamy forests and reach picturesque villages located close to the Atlantic ocean. At every small port, natural pools of lava rock invite you to a refreshing bath. A 6-day trail to discover this unique island. Although the horses stay at different trail stations every night, we always return to our base, the PÁTIO Lodge, in the evening. the subtropical island like theback of their hand." 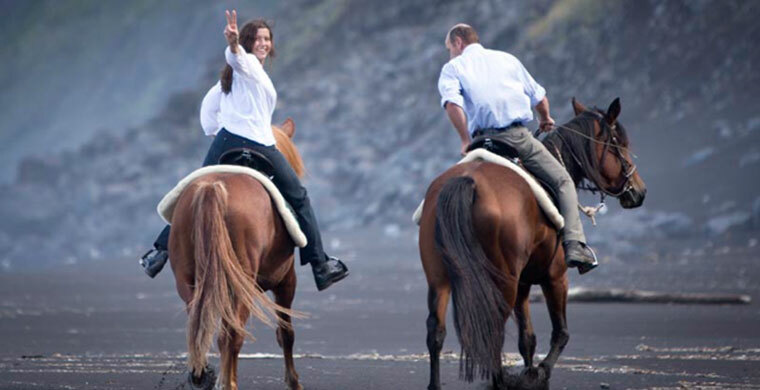 Arrival at Faial (Airport Horta – HOR), transfer to accommodation and first contact with the horses. Communal dinner. Overnight. 2nd Day: Trail to the old lighthouse "Farol da Ribeirinha"
Today’s ride passes though deserted countryside. We might pass the occasional farmer on his way to tend to his cattle. The Atlantic Ocean sparkles in the sunlight. We will enjoy a picnic at the “Cabouco” forest park. After cantering past hedges of hydrangea bushes we reach the old Lighthouse “Farol da Riberinha” with impressive views of the volcano “Pico”. The day winds down with a delicious supper at the PÁTIO Lodge. The second relaxing day of riding follows right on where the first finished, and takes us along the east coast. The giant heather bushes alongside the trail look a little like giganticb broccoli plants. We take a break at the black lava beach of “Praia Almoxarife”. The afternoon’s ride takes us to “Quinta São Lourenço”, a stud farm for Lusitano horses. The farm is located close to the island’s beautiful capital, Horta. We have enough time to take a stroll through the city - visiting the colourful harbour and taking a break at the most famous bar between Europe and America, “Peter Café Sport”. This bar offers the best gin and tonic in the Atlantic Ocean. Supper consists of mouthwatering Azorean food, served at our Lodge. 4th Day: Trail alongside the south coast to our "Jungle Camp"
The trail continues through the beautiful green valley of Flamengos. A steep track leads us down into the valley, where the air is full of the scent of thyme and mint. Long straight trails through the forest are perfect for cantering. Today we enjoy a picnic lunch in the Azorean countryside, and in the afternoon we arrive at the junglelike westside of the island full of orchards and vineyards surrounded by old black stone walls. After riding through the jungle, we reach our horses’ accommodation for the evening. Back at the Lodge our chef will serve delicious food from the island. Today’s trail leads us to the impressive and bizarre volcanic desert landscape of Capelinhos. This deserted landscape has already been the set of several science fiction movies. We pass ruins of old houses buried with ash from the volcano’s last eruption in 1957. The highly acclaimed underground Volcano Museum is located underneath the lighthouse, buried with debris from the eruption. We ride over volcanic ash and enjoy a break close to a small volcanic cave. 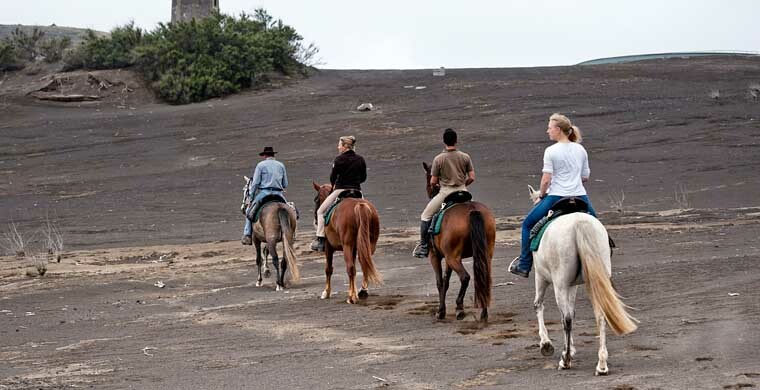 A long canter around the green volcano “Cabeço Verde” takes us back to our horses’ paddock. At the Lodge delectable food and drinks are waiting. Today we arrive at the black beach of the tip of “Fajã”. 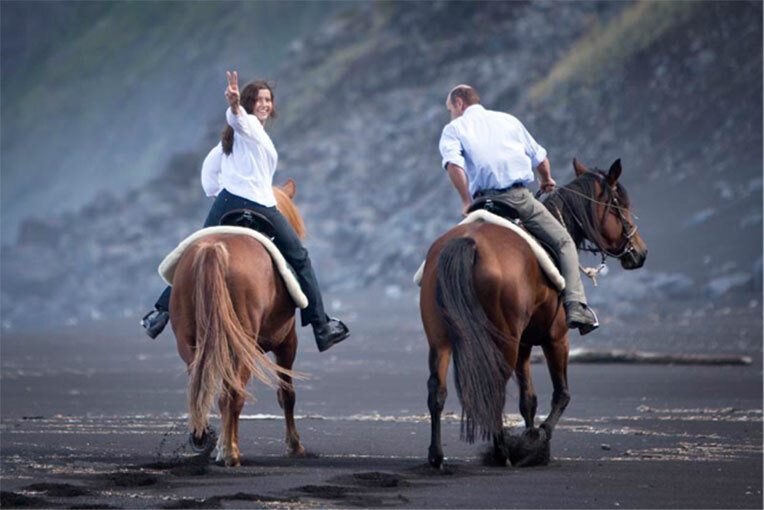 After a beautiful canter in an ancient eucalyptus forest we follow the steep trail down to “Fajã”. This uniquely beautiful location is home to vineyards, gardens and wildly romantic places. Today’s ride is a little shorter, and gives us time for a individual swim in the Atlantic or a stroll along the coast in the afternoon. This is the last day of our trail. We cross the island from the dry south to the green north, enjoying views over terraced meadows down to the blue ocean. 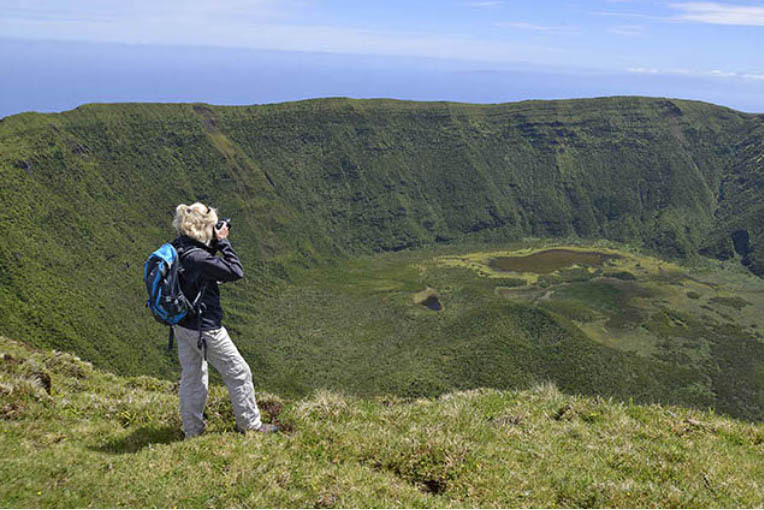 At lunchtime we arrive at Faial’s highest located village “Ribeira Funda” where we enjoy a picnic at the “Miradouro” viewpoint. Seated on sun-warmed stone benches we can listen to the wind and the wild cries of the buzzards. We move closer and closer to our final destination. 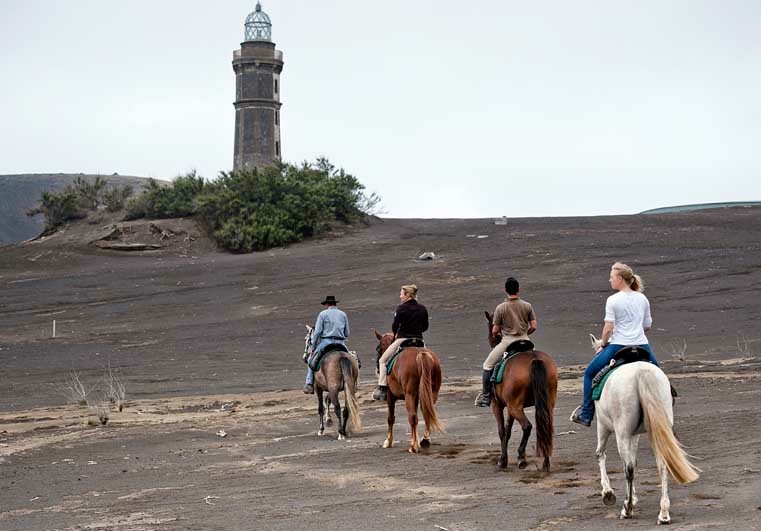 We pass the old whale watching point “Vigia dos Cedros” as we complete our circular trail of the island, returning to the Lodge with our horses. This evening we enjoy a farewell banquet. After breakfast we offer an airport transfer for departure, or you can decide on an individual extension to your stay. Sharing a double room on request and only when available. If this option is not available, we charge a single room supplement. The holiday is also suitable for accompanying nonriders. In this case, we charge an accomidation and any additional expenses will be charged seperately. > Bookable at your desired date. Daily arrival possible. > No packing of suitcases, always the same accommodation. No minimum number of participants! All trail itineraries are general guidelines and in order to offer our guests the best-riding holiday experience we may change these. Depending on the number of trails running, the season, the weather and national holidays, we may make alterations to itineraries at short notice, which could affect the number of riding hours per day, the route we take to any given destination or the use of alternative accommodation. Trails can also be ridden in both directions. All changes are at our discretion but when changes are made, we endeavour to ensure that our high standards of quality are maintained and reflected in the alternatives we choose. waterproof trekking footwear, windproof and waterproof jacket and trousers, riding helmet. Raincoats can be rent for 5€/day. Riding equipment is free of charge up to 10kg with the Azorean Airline SATA. Able to ride in all paces. Sufficient physical condition to hack for 4-5 hours. Minimum age: 16. Max. riders weight 95 kg. We expect support from our guests in feeding the trail horses, saddle, and tacking and cleaning the personal trail equipment. > Whale Watching (from 60 €) A must do! Discover with marine biologist the fascinating cetacean. > Swimming with dolphins (from 65 €) The ultimate experience. Swimming with dolphins in their natural environment. 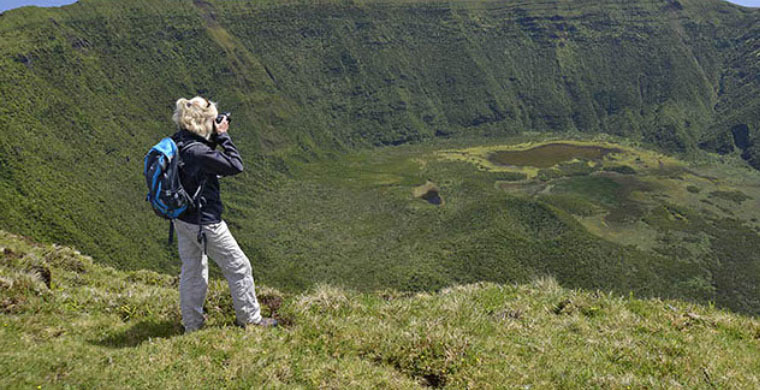 > Pico Island Tour (from 70 € from 2 Packs onward) Discover the UNESCO World Heritage Site at the foot of the 2.351m high Pico Volcano. > Descend into the crater (from 50 €) Pure Jurassic Park. 400 meter deep into the sleeping volcano of Faial Island.